Born in Ballarat, Victoria, Barry grew up in the nearby goldfields town of Smythesdale. Following an occupation in engineering, Barry turned his attention to the arts, where he undertook formal studies at the University of Ballarat. Here, among the many art-forms studied and the introduction to wood-firing under the guidance of Master Potter Peter Pilven, Barry majored in Ceramics and completed his Degree in 1998. 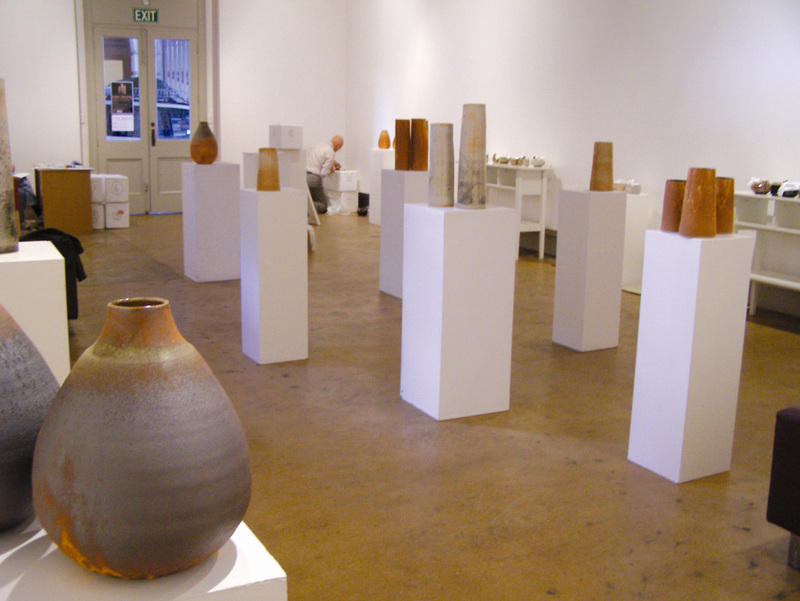 Memories of growing up in a landscape of remnant goldfields - mineshafts,clay-pits, abandoned huts, forests and farmland was clearly evident in Barry’s selection of earthy art-forms and rustic glazes during this time; much of which he brings into play today, along with gained inspiration from his travels in broader fields. Following his first solo exhibition in Melbourne, and being the receipt of a travel award, Barry’s journey led him to Japan where he followed the Old Kiln Trails; meeting and studying with prominent potters of Kyoto, Tokaname and Hagi. This experience heightened his already gained interests in Japanese ceramics - particularly teapots, beakers, bottles and bowls - from which Barry’s first two awards were for wood-fired Sake Bottle forms. Following several joint and solo exhibitions, journeys of Alaska and Canada Inspired a solo exhibition relating to the iconic Grain Silos of the vast prairie regions of Canada. New forms from this exhibition culminated in further works being selected for the Art Gallery of Ballarat permanent collection. ln 2010, a new body of earthy forms for a solo exhibition at Port Augusta Cultural Centre - Yarta Purtli, resulted from an awarded residency at Grindell’s Hut, courtesy of Port Augusta City Council and National Parks South Australia. Although this body of work held Japanese influences, further development in the field of ever expanding interests concerning surface textures and sculptural forms were presented. Aroused by exposure afforded by the residency, Barry also displayed a strength in his love for his roots and belief in country. Community interests saw further accomplishments as Artist in Residence at Marrickville in Sydney, and Ballarat, where Barry conducted bookbinding workshops with disengaged groups within their communities. Barry says considerable personal experience and insight was gained, where, in major city environments, the overall experience presented new outlooks and artistic opportunities. Travelling the Nullarbor and working on a cattle station in central WA in 2013 granted further inspiration, where landforms, textures and colour again featured strongly with his pursuit in artistic interests. Barry says it is an enjoyable and rewarding challenge to travel, return to base, and make his varied art-forms within the pleasant rural surroundings of his Red Echidna Studios at Smythes Creek. His motto - enjoy the journey!